Above: Cloud Mine is an opalescent/iridescent mint green shade with gold flash. This shade is just beautiful and applied perfectly in 2 coats (note: all are shown using 2 coats). Below: Flight of Fancy is a coral pink shade with glass-flecked shimmer. This is a very delicate shade and I love this type of finish. Below: Enchante is a hot pink shimmer that has that 'lit from within' glow to it. Below: Eyes Wide Open is a vibrant orange shimmer that also seems to glow. Below: Call me crazy (that's not the name of the polish! ), but I actually like a frost finish if--and that's a big if, because it doesn't often happen--I can get a decent finish without streaking. Sparkling Champagne (below) and Starry Eyed (under Sparkling Champagne) both gave me a true frost finish, streak-free, in 2 coats. A week or so ago I posted bottle pictures and the press release description from Jessica Cosmetics Spring 2010 Collection called the Daydream Collection. You can view that post here. These are scheduled for an April release and they retail for $7.50 on their web site. I have also purchased this brand from Hello-Gorgeous.net, although I don't know if or when they'll be stocking this collection. 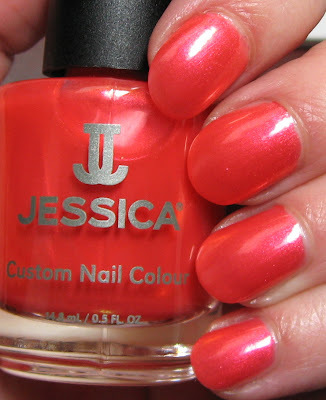 I am fairly new to the Jessica line of polishes, but after trying some for the first time last last year, I rank them in my top 5 brands for application and wear. They apply well in 2 coats, dry quickly, and wear extremely well. The formula is what I call self-leveling, meaning that any streaks or unevenness you see during the application, seem to disappear on their own and meld into a perfect finish. They offer a wide range of colors and finishes, and on a completely aesthetic note, I love their bottles! They're heavy and substantial, and while we're discussing packaging, the handle and brush work very well, size-wise and quality-wise. My thoughts on this particular collection are quite simple: I love them! As I was using each one, I thought a few times that some of you may not care for some of the colors... "too many pinks", "not colors I would use", and so on. Of course, everyone does not care for the same shade, but I was a little relieved personally, to see something other than a collection of pastel creme shades. I have more than enough of those, so these, while not the norm for this spring, are still very seasonal colors, with a number of them being year-round shades. I particularly liked the array of finishes. The 2 shades that I consider frosts (Starry Eyed and Perchance to Dream), finished with a look that is indeed frost, but without the application issues that generally turn me away from this type of finish. There's quite a mix of finishes in this collection, including glass-flecked, frost, opalescent or iridescent, and the 2 that seem to glow, Eyes Wide Open and Enchante. A change of pace in the color selections, a variety of finishes, and a quality polish...that's why I love them! *This post features sample products furnished by the manufacturer or PR firm. I like that there's a variety of finishes too, Mary! This is a really pretty collection and you presented it so well. Thanks for the swatches! Cloud Mine is the standout to me. I really like all of the polishes. I love that "lit from within" finish. I also don't mind frost finishes. Ya,I'm glad too. To see a collection that isn't all pastels. Beautiful colors,and finishes. Cloud Mine is so unique! Cloud mine is pretty, looks like it could be a close dupe to Walgreens brand called Eva Supreme..can't remember the name of it.